There is some good news in the report. Small businesses have been steadily improving their balance sheets since the beginning of the recession and loan delinquencies are at historically very low levels, with severe delinquencies much lower than 2005 the first year for which data is available. However, the report goes on to say that small business investment rates are lower than in 2005 as companies pay down debt and build cash. Banks are under-loaned with loan to deposit ratios of 60-70% and are competing hard for the few high quality loans that are available. While businesses are being cautious in this difficult economic environment, it also reflects the fact that bank credit standards have tightened dramatically since the recession began. Many small businesses that formerly had access to bank credit are excluded from the banking market and forced to rely on non-bank credit sources which are often far more expensive. The PayNet index predicted the 2008 crash early in the spring of 2008 with warning signs starting in early 2007 and it appears to have predicted the end of the recession in 2009 by several months. 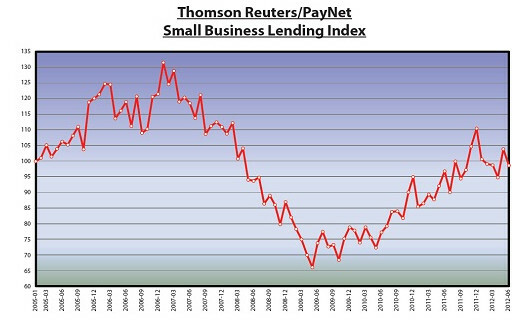 Currently the index shows that we have likely entered into a more difficult period for small business borrowers and perhaps for the economy as a whole. Unlike the large multinationals that dominate the financial news, American small businesses still retain a primarily domestic focus and their health is likely a good indicator of the real health of Main Street America. Certainly this is an indicator that bears watching closely in coming months.